In 2016, women of reproductive age (18 to 44) were most familiar with birth control pills and condoms; only 31 percent of those women had heard a lot about two more-effective methods, intrauterine devices (IUDs) and implants. Less than half of women viewed IUDs as very effective at preventing pregnancy, and even less—37 percent—viewed implants as very effective. More than one in five women were unsure of the safety of IUDs or implants. Women with knowledge gaps about IUDs and implants were more likely to be nonwhite, non-Hispanic, low income, and single and to have never been pregnant. Unintended pregnancies can have major repercussions that affect a woman’s life and life course. These mistimed or unwanted pregnancies are associated with negative health and economic outcomes for women of all ages and their families (Cheng et al. 2009; Gipson, Koenig, and Hindin 2008). Contraception can help a woman and her partner prevent an unintended pregnancy and may also be associated with broader health, social, and economic benefits for women and their families (Bailey 2013; Sonfield et al. 2013). Moreover, women report that contraception allows them to take better care of themselves and their families by completing their education, keeping a job, and supporting themselves financially (Frost and Duberstein Lindberg 2013). Unsurprisingly, most unintended pregnancies occur among women who are not using contraception effectively. Women who do not use birth control or who have long gaps in use account for 54 percent of these unintended pregnancies, and women who use birth control inconsistently or incorrectly account for another 41 percent. Only 5 percent of unintended pregnancies occur among women who consistently use contraception correctly (Guttmacher Institute 2016). Despite an increase in LARC use, the birth control pill and female sterilization remain the most commonly chosen methods among contraception users at 25.9 and 25.1 percent in 2011–13, respectively (Daniels et al. 2015). Several factors have been cited as influencing a women’s choice of contraception method, including her awareness and perceptions of the effectiveness and safety of the method (Raine, Minnis, and Padian 2003; Yee and Simon 2011). Moreover, LARCs in particular have been associated with many myths and misconceptions about their safety and side effects; such misinformation may contribute to lower use (Russo, Miller, and Gold 2013). Women’s use of LARC methods has increased, but current, nationally representative information is limited on women’s awareness and perceptions of birth control methods that inform efforts to further increase take-up of effective forms of birth control. This brief uses new data collected in the first quarter of 2016 to explore women’s familiarity with various birth control methods, particularly LARCs, and how women of reproductive age (18 to 44) view the safety and effectiveness of each method. We also highlight differences in the characteristics of women who are more informed versus those who are less informed about LARCs to help target efforts to improve knowledge of these highly effective birth control methods. 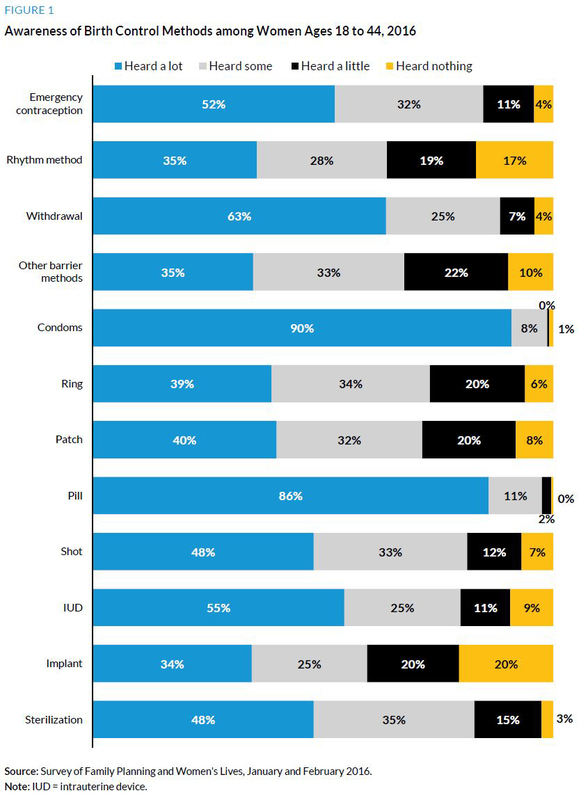 This brief uses data from the first wave of the Survey of Family Planning and Women’s Lives to assess women’s perceptions of various birth control methods. The Survey of Family Planning and Women’s Lives is a nationally representative survey of women of reproductive age that addresses the perceptions and use of birth control methods and the short- and long-term effects of birth control and unplanned births.3 We examine all birth control methods approved by the US Food and Drug Administration (FDA) and other common methods such as withdrawal and natural family planning, or the rhythm method (table 1). For all methods except birth control pills and condoms, the survey includes additional explanatory text with an alternate name or name-brand method (e.g., Mirena as an example of an IUD and Plan B for emergency contraception). The survey defines birth control as “any action a woman or her partner might take to prevent becoming pregnant.” In addition, the survey collects demographic and socioeconomic information and reproductive history to provide context for the findings. The survey is one part of a broader ongoing research project assessing the short- and long-term effects of access to affordable contraception and of barriers to its use. All women were asked questions on safety and effectiveness, including women who had heard nothing at all about the method. Because this brief focuses on information and awareness gaps, we also report a category for women who responded “don’t know” to these questions. We assess responses against known attributes of the different methods. For example, we consider the extent to which women’s relative perceptions of the effectiveness of various methods are consistent with the information in table 1. For perceptions of safety, we focus on the share of women who perceive the method of interest to be very safe or very unsafe or who are unsure about a method’s safety. Perceived safety may reflect not only the risk of the method itself to a woman’s health, but also the risk of sexually transmitted infections (STIs) associated with using a given method. For example, all FDA-approved methods have been deemed “safe” for women’s use, but only barrier methods such as condoms can protect against STIs. Therefore, we assume that a response of “very unsafe” indicates a significant misperception and that a response of “very safe” implies few concerns with the overall health risks of a given method. Those reporting “don’t know” about the safety of a particular method appear to have a knowledge gap. We also compare characteristics of women who have awareness gaps or misperceptions about LARCs to characteristics of other women of reproductive age. We define women with an awareness gap about LARCs as those who, for both IUDs and implants, (1) have heard only a little or nothing at all about the method, (2) view the method as not very effective or do not know the effectiveness, or (3) view the method as very unsafe or do not know the safety of the method.6 We compare those women to women who are more familiar with LARCs and are more knowledgeable about their safety and effectiveness. The characteristics examined include (1) age (18 to 25, 26 to 34, or 35 to 44), (2) race and ethnicity (white non-Hispanic; black or other non-Hispanic; or Hispanic), (3) educational attainment (less than high school degree, high school degree or equivalent, or some college education or higher), (4) marital status (married; widowed, separated, or divorced; never married; or living with partner), (5) employment status (working or not working), (6) health insurance coverage (insured or uninsured), (7) homeownership (lives in home owned by someone in household or not), (8) sexual activity (sexually active with men in the past six months or not), and (9) pregnancy experience (never been pregnant or had one or more pregnancies). In early 2016, nearly all women responded that they were familiar with condoms and birth control pills (figure 1), with 90 percent and 86 percent, respectively, reporting that they had heard a lot about those methods. Across the full range of methods studied, a majority of women had heard some or a lot about each method. Among the hormonal methods, women were least aware of the ring and the patch. Women also had limited awareness of other barrier methods beyond condoms. Interestingly, women reported high awareness of the withdrawal method, but fairly low awareness of the rhythm method. Half of women (55 percent) reported that they had heard a lot about IUDs, and another 25 percent reported they had heard some about that method. Of the women surveyed, 20 percent reported that they had heard little (11 percent) or nothing at all (9 percent) about IUDs. Women were far less familiar with the other LARC method, implants. Only 34 percent reported that they had heard a lot about implants, the lowest percentage among all methods included in the survey. One in five women (20 percent) reported they had heard nothing at all about implants. Only 31 percent of women had heard a lot about both IUDs and implants (data not shown). The share of women who have heard little or nothing about IUDs and implants highlights the need for increased efforts to improve awareness of those methods. Among women of reproductive age, sterilization (male or female) was by far most often viewed as very effective at preventing pregnancy (77 percent, figure 2). No more than half of women viewed any other method as very effective at preventing pregnancy. About half of women (47 percent) viewed IUDs as very effective, 3 in 10 women (31 percent) viewed IUDs as somewhat effective, 3 percent viewed them as not very effective, and another 19 percent did not know the effectiveness of IUDs. Misperceptions and lack of awareness of the effectiveness of implants was even more common, with 28 percent of women reporting that implants were somewhat effective and 32 percent not knowing the effectiveness of implants. Only 37 percent viewed the implant as very effective, even less than those who viewed the pill as very effective at preventing pregnancy. Women who reported that they did not know about the effectiveness of IUDs and implants, although small in sample size, included those who had heard little or nothing about the methods generally (roughly 60–70 percent) and those who had heard some or a lot about the methods (roughly 30–40 percent, data not shown). Although women appeared to underestimate the effectiveness of LARCs, they did seem aware of limitations in effectiveness of other methods and generally ranked the order of the other methods accurately according to their effectiveness. For example, higher shares of women viewed the birth control shot and pill as very effective at preventing pregnancy. Other barrier methods, the rhythm method, and withdrawal were the least likely to be perceived as very effective. Other potential knowledge gaps include a somewhat inflated perception of the effectiveness of condoms. 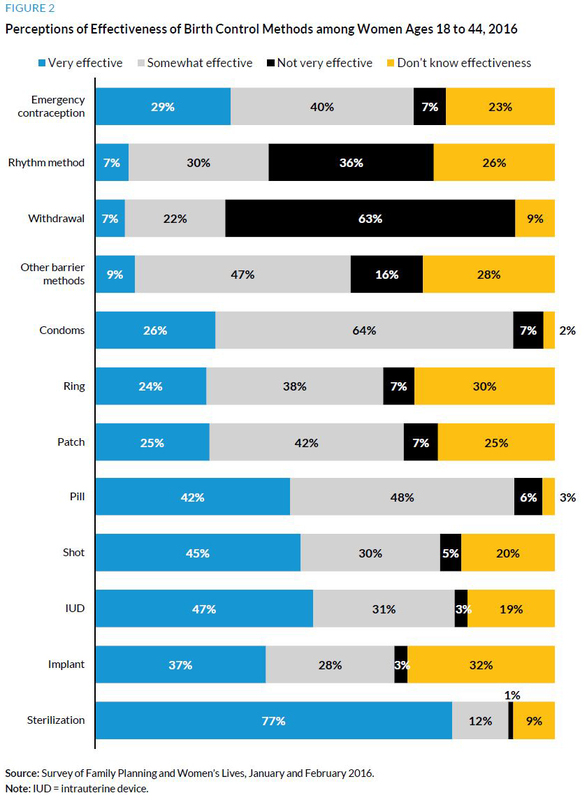 Only 7 percent of women viewed condoms as not very effective, a share similar to perceived rates for implants and all hormonal methods (e.g., shot, pill, patch, and ring). Finally, consistent with their overall awareness of these methods, women appeared to lack awareness and understanding of the efficacy of the birth control ring and patch. Perceptions about the safety of birth control can also shape women’s choices about use. In early 2016, condoms were the method most often viewed by women as very safe (61 percent of women, figure 3). About 4 in 10 women of reproductive age viewed sterilization, the rhythm method, and withdrawal as very safe (42 percent, 41 percent, and 38 percent, respectively). No other method was perceived as very safe by more than 25 percent of women. Relatively few women perceived any method as very unsafe (8 percent or less), with the exception of withdrawal (22 percent). Significant uncertainty about the safety of many methods was reported, however. About 23 percent of women did not know about the safety of IUDs, and 30 percent did not know about implant safety. Similar rates of uncertainty were reported for hormonal methods including the shot, patch, ring, and emergency contraception, as well as nonprescription methods such as the rhythm method and barrier methods excluding condoms. Sterilization, birth control pills, condoms, and withdrawal were associated with less uncertainty. Which Women Have Knowledge Gaps or Misperceptions about LARCs? Overall, we find that fully 33 percent of women are either unaware of LARCs (including both IUDs and implants) or have misperceptions about their effectiveness or safety. In table 2, we compare the characteristics of women who are less aware of the methods or have knowledge gaps about effectiveness and safety to those of women who are more familiar with the methods and knowledgeable about their safety and effectiveness. 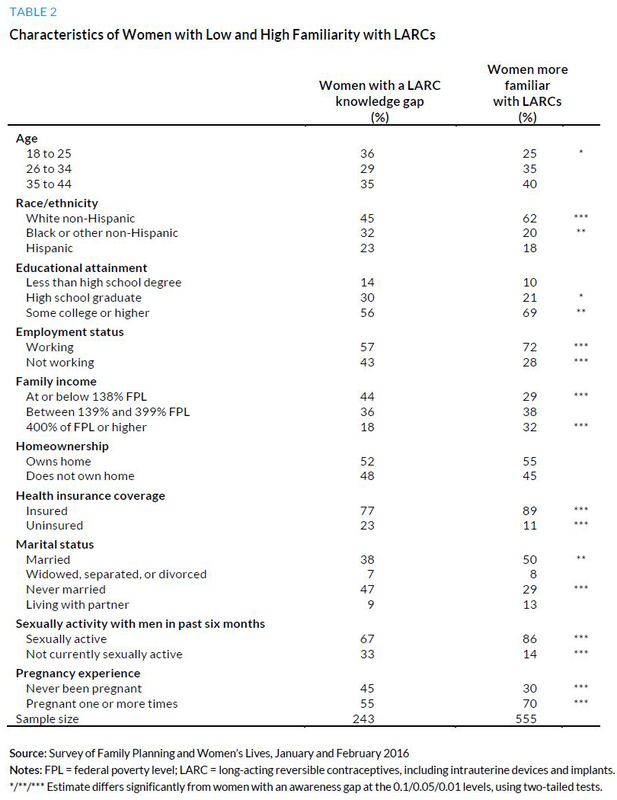 Women who have a LARC knowledge gap are more likely to be age 18 to 25, black or other non-Hispanic, not working, uninsured, and to have family income at or below 138 percent of the federal poverty level (FPL). We also find that women who have knowledge gaps are more likely to have never married, to not be currently sexually active with men, and to have never been pregnant. Despite increased use of LARC methods over the past decade, just 31 percent of women of reproductive age say they have heard a lot about both IUDs and implants. Women are most familiar with methods that have been available for longer and are easier to obtain—such as the birth control pill and condom—but are less reliable when it comes to preventing unintended pregnancy. Fully 80 percent said that they had heard a lot about the pill and condoms. In contrast, just over half of women of reproductive age had heard a lot about IUDs, and only one-third had heard a lot about implants. Across all the methods included in the survey, women had heard the least about implants. Improving general awareness of those methods is likely a necessary step in further increasing the use of LARCs. Beyond increasing general awareness of the range of different birth control methods that are available, this research also suggests a need to address uncertainty and misperceptions about birth control safety and effectiveness. With the exception of LARC methods, women generally perceived the relative effectiveness of various methods accurately. But less than half of women viewed IUDs as very effective, with even lower perceived effectiveness for implants (37 percent). These percentages compare to the 77 percent of women that viewed sterilization as very effective. Given that the probability of becoming pregnant when using an IUD or an implant is similar to that for sterilization, this finding reflects significant misperceptions about LARC effectiveness. Understanding women’s perceptions of safety is more complex because there is no clear ranking of the safety of various methods against which to compare women’s perceptions. Because the FDA approves all prescription methods as safe, we would interpret reports of very unsafe as significant misperceptions. It is encouraging that most women do not judge any methods, including LARCs, as very unsafe. This finding suggests that lingering fears related to the Dalkon shield, an IUD recalled in the early 1970s, are not prevalent among today’s women of reproductive age. Of more concern, however, is the share of women who report uncertainty about the safety of many methods. Of the 12 methods examined, more than 20 percent of women reported not knowing how to rate the safety for 8 of those methods. This included 23 percent of women who were unsure of IUD safety and 30 percent of women who were unsure of implant safety. Some of this uncertainty may reflect a lack of awareness of the methods, but some may also suggest an uncertainty in how to interpret the question. Women may have attempted to assess both the safety of the method itself and the potential risk of sexually transmitted infections using that method. Those distinct concepts about contraceptive method safety could be more clearly communicated. With the recent threat of Zika virus and other long-standing STIs, distinguishing between the pregnancy prevention and STI protection available from various methods is important. We find that more than 31 percent of women have knowledge gaps about LARCs. Those with knowledge gaps are more likely to be in the racial and ethnic category of black or other non-Hispanic, and they have lower incomes than those with more familiarity with these methods, which in turn likely puts them at higher risk for an unintended pregnancy. Women lacking knowledge of LARCs are also more likely to be single and to have never been pregnant, which may reflect continued uncertainty about the use of LARCs for those without children and those not currently sexually active with men. Whereas the latter group of women may not be in immediate need of birth control, informing those women of effective options would help them make better decisions if they do initiate sexual activity that puts them at risk of unplanned pregnancy. Recent evidence indicates that the share of pregnancies that were unintended declined from 51 percent in 2008 to 45 percent in 2011 after having remained fairly constant over the previous decades (Finer and Zolna 2016; Guttmacher Institute 2016). Despite this decrease, nearly half of all pregnancies—or about 2.8 million each year—were unintended. LARCs present a very promising approach to further reducing unplanned pregnancy rates, particularly among young women who want to delay childbearing. Both public and private insurance policies have been moving in the direction of making LARCs more accessible and affordable to all women. However, this analysis shows that, even in early 2016, women of reproductive age still lacked awareness and understanding of the effectiveness and safety of those methods. Outreach and education is likely to help reduce some of the knowledge gaps and continue the increased use of LARCs. Additional understanding about how women perceive the role of contraception and the impacts of unplanned birth in their lives, including their education, workforce participation, and family formation, will be critical to improving the effectiveness of policies aimed at reducing unplanned pregnancy. Future products from this survey and project will provide insights on those issues and present a current picture of women’s contraceptive method choices and satisfaction with those methods. ACOG (American College of Obstetricians and Gynecologists). 2011. “Long-Acting Reversible Contraception: Implants and Intrauterine Devices.” Practice Bulletin 121. Washington, DC: American College of Obstetricians and Gynecologists. Bailey, Martha J. 2013. “Fifty Years of Family Planning: New Evidence on the Long-Run Effects of Increasing Access to Contraception.” Working Paper 19493. Cambridge, MA: National Bureau of Economic Research. Cheng, Diana, Eleanor B. Schwarz, Erika Douglas, and Isabelle Horon. 2009. “Unintended Pregnancy and Associated Maternal Preconception, Prenatal and Postpartum Behaviors.” Contraception 79 (3): 194–98. Daniels, Kimberly, Jill Daugherty, Jo Jones, and William Mosher. 2015. “Current Contraceptive Use and Variation by Selected Characteristics among Women Aged 15–44: United States, 2011–2013.” National Health Statistics Reports 86. Finer, Lawrence B., and Mia R. Zolna. 2016. “Declines in Unintended Pregnancy in the United States, 2008–2011.” New England Journal of Medicine 374: 843–52. Frost, Jennifer J., and Laura Duberstein Lindberg. 2013. “Reasons for Using Contraception: Perspectives of US Women Seeking Care at Specialized Family Planning Clinics.” Contraception 87 (4): 465–72. Gipson, Jessica D., Michael A. Koenig, and Michelle J. Hindin. 2008. “The Effects of Unintended Pregnancy on Infant, Child, and Parental Health: A Review of the Literature.” Studies in Family Planning 39 (1): 18–38. Guttmacher Institute. 2016. “Unintended Pregnancy in the United States.” New York: Guttmacher Institute. Raine, Tina, Alexandra M. Minnis, and Nancy S. Padian. 2003. “Determinants of Contraceptive Method among Young Women at Risk for Unintended Pregnancy and Sexually Transmitted Infections.” Contraception 68 (1): 19–25. Russo, Jennefer A., Elizabeth Miller, and Melanie A. Gold. 2013. “Myths and Misconceptions about Long-Acting Reversible Contraception (LARC).” Journal of Adolescent Health 52: S14–S21. Sonfield, Adam, Kinsey Hasstedt, Megan L. Kavanaugh, and Ragnar Anderson. 2013. “The Social and Economic Benefits of Women’s Ability to Determine Whether and When to Have Children.” New York: Guttmacher Institute. Yee, Lynn, and Melissa Simon. 2011. “The Role of the Social Network in Contraceptive Decision-making Among Young, African American and Latina Women.” Journal of Adolescent Health 47 (4): 374–80. Adele Shartzer is a research associate in the Health Policy Center at the Urban Institute. Her recent work focuses on health coverage, access to care, and the health care delivery system, including the impact of the Affordable Care Act on women of reproductive age. Brigette Courtot is a senior research associate in the Health Policy Center at the Urban Institute, where she has more than a decade of experience conducting health policy research and analysis, with a focus on maternal and child health and access to care for underserved populations. Stacey McMorrow is a health economist with extensive experience using quantitative methods to study the factors that affect individual health insurance coverage and access to care as well as the impacts of state and national health reforms on employers and individuals. Her current work uses the Affordable Care Act and past Medicaid expansions to explore the effects of expanding insurance coverage on access to care, service use, and health outcomes for various populations. Sarah Benatar is a senior research associate in the Health Policy Center at the Urban Institute. Her research investigates how public policies affect vulnerable populations, health outcomes, access to care, use of services, and enrollment in coverage programs, with a particular focus on maternal and child health. Genevieve M. Kenney is a senior fellow and codirector of the Health Policy Center at the Urban Institute. She has been conducting policy research for over 25 years and is a nationally renowned expert on Medicaid, the Children's Health Insurance Program (CHIP), and broader health insurance coverage and health issues facing low-income children and families. This brief was funded by the William and Flora Hewlett Foundation. We are grateful to them and to all our funders, who make it possible for Urban to advance its mission. The authors would like to thank Christine Clark and Ruth Levine with the Hewlett Foundation as well as the Beyond Birth Control: Family Planning and Women’s Lives advisory group members for their comments and suggestions on the survey instrument and the brief.